New VADs destined for military hospitals joined a detachment for one month’s probation, and if suitable, they signed a contract for a further six months service, receiving £20 per annum and a uniform allowance of £4. 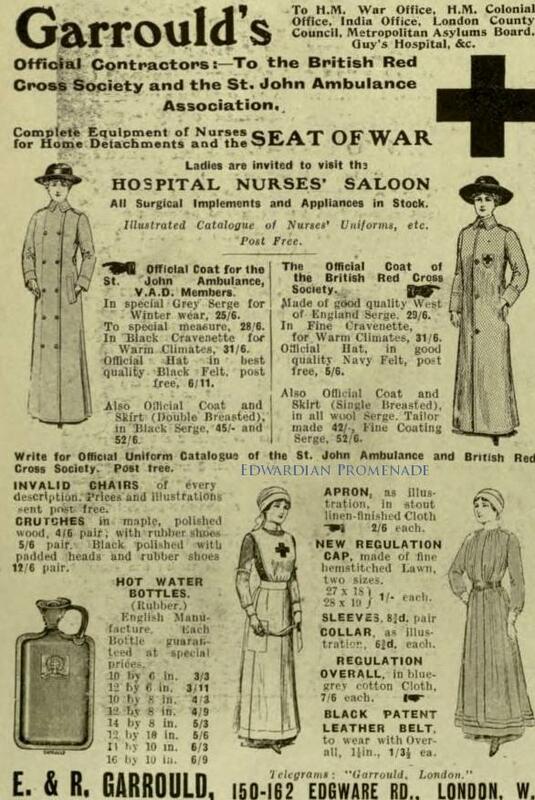 There were a variety of places where one could obtain a uniform, including the tailoring departments in posh stores like Harrods, but Garrould’s of Edgeware Road were the official contractors to the British Red Cross Society & St. John’s Ambulance. The £4 didn’t go very far, since the VAD was required to purchase 3 dresses, 16 aprons, 1 hat, 1 overcoat, 12 collars, 8 caps, 4 white belts, 6 pairs of sleeves, and 1 Macintosh apron–all at a total cost of £6.12d.8s.–plus the annual upkeep of new dresses, sleeves, et al (a further £2). The cost of leather ward shoes could up the expenses considerably! So you can see that VAD service was mostly populated by well-to-do women, not because of rigid class lines, but because of the prohibitive costs.